Lots of new bank branches are popping up around Sunset Park. 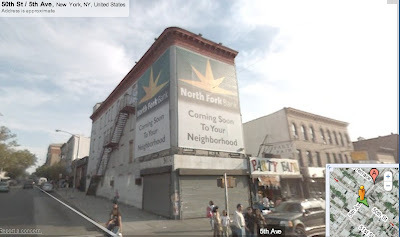 Besides the seeming dozens of Chinese banks on 8th Avenue, the new Amalgamated on 5th and 45th, and now North Fork Bank will show up on 5th and 50th. 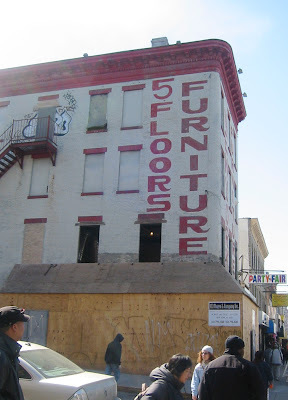 What's too bad, however, is that the deep red lettering that adorns the top three stories of the building will probably be removed or covered up. I'm not sure why I like the lettering so much. Is it the "kick" that the Rs get to do? Is it the shade of red that we don't see much anymore? 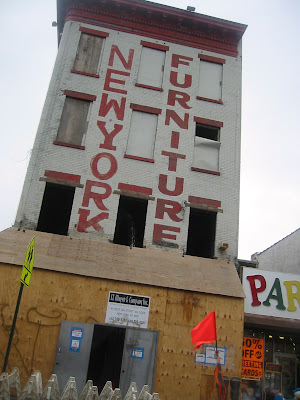 I tried to figure out why the New York Furniture facade seemed so new to me lately, and when I looked up the intersection on Google Map's Streetview I remembered that the banners seen below had been up a long time. I wonder if NFB will use some paint to create their logo...somehow I doubt it. They did have a fantastic mosaic at their branch in Harlem, however. Check it out here. Could we get them to put up a mural or other artwork inspired by Sunset Park? Citibank did.